This in one of my all time favorite cakes- and it uses fresh strawberries. No time like the present-fresh strawberries are plentiful at Lineberger’s Maple Springs Farm in Dallas and elsewhere. 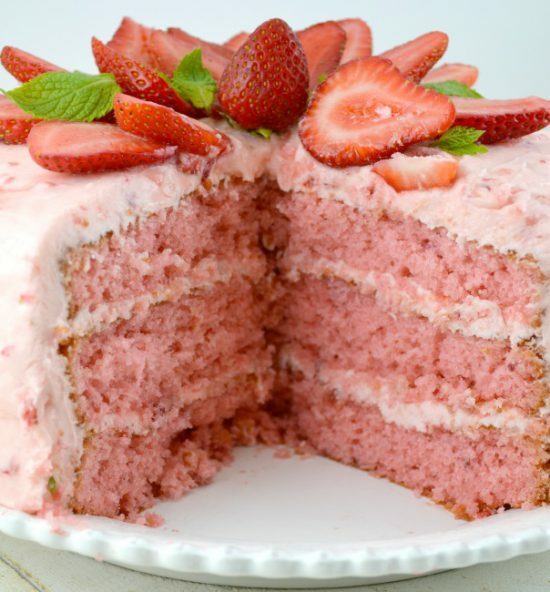 This cake does use a bought cake mix, but the addition of fresh strawberries in the batter as well as the frosting makes it plenty moist and adds lots of color and strawberry flavor. It’s very strawberry-enjoy! 1. Make the Cake: Preheat the Oven to 350 degrees. Spray 3- 9 inch cake pans with nonstick cooking spray. Set aside. to medium and beat for 3 minutes. 6. Spread one of the layers of cake with frosting then refrigerate. Frost the second layer and refrigerate until the frosting on both layers has firmed up a bit. Assemble all the layers and frost the top and sides. Refrigerate!